Col. Jao Denison Maia Correia, Programme Manager Combatente Brasileiro (COBRA) explained that the programme was borne out of a need to impose modernity on the Brazilian Army. There are over 200,000 personnel in the Brazilian Army, largely made up of conscripts although roughly 40 percent are now professional soldiers. The basic unit of employment in the Army is the Brigade. There are currently 26 brigades a one aviation brigade with Col. Correia cited the light infantry and Special Operation brigades as being very important to the project. Brazil is the fifth largest country in the world, having 4600 miles of Atlantic coast and 9800 miles of international borders – bordering every country in South America apart from Chile and Ecuador – making it the third largest land border in the world. The country consists of five very different land regions north, mid west, north east, south east and south. Each one has different aspects of culture, economy climate and population density, linked to specific consideration of military operations.The northern region includes the Amazon basin, hot and humid, largely covered by thick forest and the world's fourth largest fresh water source. With less than eight inhabitants per square mile, it also occupies 61 percent of Brazil's territory. Based on this information the Brazilian army decided to produce two versions of the project the Amazon Cobra and Regular COBRA. There are currently five jungle infantry brigades. In generating requirements for COBRA, the focus has been on asymmetric conflict. Col. Correia said, “In order to start planning for the project it was important to first analyse three questions – How to organise forces? How to equip them? 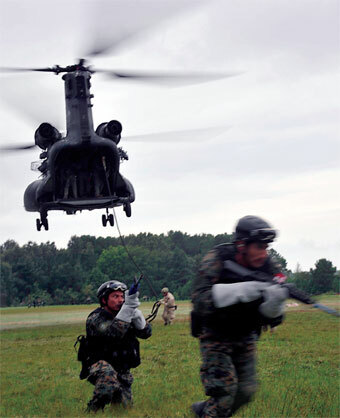 How to fight?” The answers coalesced into five key area: situational awareness of the soldier in terms of time space and intelligence which is separate from the second category of command and control which is defined as interoperability and interconnectivity in the tactical environment. Other categories include modularity, capability enhancement to existing capabilities and the application of technology to solve the problems being faced. COBRA is an individual combat system but must be still network connected and linked to central command, improving the soldier's efficiency in communication, positioning and navigation, firepower, protection and survivability. Work on these categories is divided into two broad areas: electronic systems and monitoring and secondly new materials in terms of protection and lethal capacity. Also in 2009, Brazil took their initial buys of equipment and began using them individually and in combination in an extended test and evaluation phase which will continue to at least until 2013. COBRA is also being integrated into other programmes. 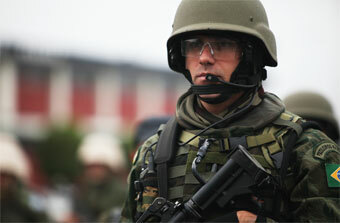 In 2009, Brazil began work on developing new armoured vehicles. From 2011 COBRA will begin integration with this vehicle. It is at this point that COBRA will move from being a project and start becoming part of a system. In developing the protection module the COBRA programme is making particular use of indigenous capability with clothing and protection. Col. Correia cites new candidate materials developed in the country, including the Nylon 66 textile which provides UV protection; the polymer Nitya yarn for high durability and the Emana textile used to decrease muscle fatigue by reducing the build-up on lactic acid in the muscles. Everything the soldier carries load carriage and belongs to the survivability module as part of the logistics systems. A new 5.56mm weapon will also be acquired and its on board sighting systems will also contribute to the observation abilities of the system such as the target acquisition device. Observation capabilities will also be added to by Brazil's new wheeled armoured vehicles.